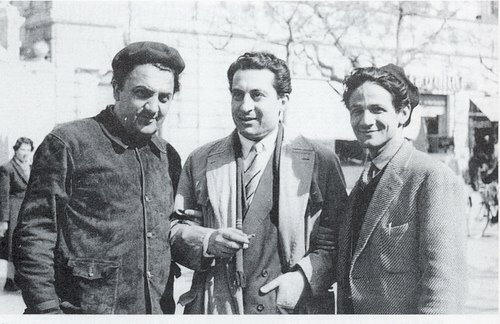 The possibly apocryphal story goes that Tullio Pinelli (pictured right, with Fellini and Leopoldo Trieste) met Federico Fellini at a newsstand at which they happened to be reading opposite pages of the same newspaper. Whether this is true or not, what is apparent is that Pinelli would go on to become Fellini’s longest-standing creative collaborator, outlasting even the great composer Nino Rota’s association with il maestro. Already an experienced screenwriter, in 1950 he co-wrote the screenplay for Luci del varietà [Variety Lights] with Fellini and Alberto Lattuada, soon to be followed by the poorly received Lo Sceicco bianco [The White Sheik] (1952). It would not be until their I Vitelloni (1953), co-scripted with noted writer Ennio Flaiano, that the world began to take notice of this new director’s take on cinematic language. Pinelli would continue to work with Fellini on all of his significant films of the 1950s and 60s, though their partnership took a hiatus after 1965’s Giulietta degli spiriti [Juliet of the Spirits], in a period which saw both the director’s experimentation with LSD and his subsequent nervous breakdown. They would not collaborate again until 1986’s Ginger e Fred and the director’s final film La voce della luna [The voice of the Moon] (1990). In the meantime, he wrote the screenplays for many commedia all’italiana films with such directorial luminaries as Pietro Germi, Mario Monicelli, Dino Risi, Alberto Sordi and Vittorio De Sica, adding to his already impressive CV which could also show Antonio Pietrangeli and Roberto Rossellini as employers. Pinelli died on March 7, 2009 in Rome.